We investigated the composition and spatial distribution of tree species and their environmental and edaphic correlates within the Snyder-Middleswarth Natural Area old-growth forest located in the narrow and steep ravine of Swift Run in central Pennsylvania. Eighty nested quadrats sampled along 5 topographic transects (16 quadrats each) encountered eastern hemlock (Tsuga canadensis), yellow birch (Betula alleghaniensis), black birch (Betula lenta), chestnut oak (Quercus montana), red maple (Acer rubrum), striped maple (A. pensylvanicum), and eastern white pine (Pinus strobus). The occurrences of these species differed by topography. Increasing soil phosphorus and potassium, and elevation correlated significantly with shift from hemlock and yellow birch-dominated bottomlands to ridge tops dominated by chestnut oak and red maple. Increasing soil acidity was significantly correlated with the shift from yellow birch-dominated quadrats to those primarily occupied by hemlock. Size distributions suggest that hemlock and yellow birch populations are stable, while those of black birch indicate episodic recruitment that may follow tree falls and other perturbations. Size distributions for chestnut oak imply impacts from white-tail deer browsing. INTRODUCTIONOld-growth forests have become increasingly rare in North America since the time of European colonization and today represent a tiny fraction of the total forested area of the eastern United States (Nowacki and Abrams 1994, Rooney 1995, Orwig and Abrams 1999). Old-growth forest is particularly rare in central Pennsylvania because of intensive logging for timber and charcoal production during the past 150 years (Nowacki and Abrams 1992, Abrams and Orwig 1996). As a consequence, eastern old-growth forest, and Pennsylvania old-growth forest in particular, exist in small stands that are isolated from other old-growth forests by an intervening matrix of successional forests (Smith 1989, Farr and Tyndall 1992, Tyrrell and Crow 1994). The Snyder-Middleswarth Natural Area within the Bald Eagle State Forest is one of the few stands of old-growth forest remaining in Pennsylvania and is among the largest such stands existing within Pennsylvania state forests [Pennsylvania Bureau of Forestry (no date)]. Although several other Pennsylvania old-growth forests have been examined (e.g., Whitney 1984, Rooney 1995, Rooney and Dress 1997, Orwig and Abrams 1999), we are unaware of any formal vegetation studies at the Snyder-Middleswarth Natural Area. Five tree species dominate the Snyder-Middleswarth landscape including eastern hemlock [Tsuga canadensis (L.) Carriere], yellow birch (Betula alleghaniensis Britton), black birch (Betula lenta L.), red maple (Acer rubrum L.) and chestnut oak [Quercus montana Willd.-here we follow the recommendations of J. W. Hardin (1979) and use the name Q. montana because of the confusion surrounding the application of the name Q. prinus L.]. Two additional tree species, eastern white pine (Pinus strobus L.) and striped maple (Acer pensylvanicum L.), are present but are far less common. The dominant tree species are visibly segregated within this forest perhaps owing to the environmental and edaphic variation ranging from the Swift Run bottomlands to the slopes and ridge tops, the adaptations of species to subsets of environmental and edaphic conditions, differential exposure to wind and storm events, and the years of competitive interactions among species. The Snyder-Middleswarth Natural Area has been described as ". . .an exceptional block of completely uncut virgin forest occupying the steep valley of Swift Run. The bottoms and north [-facing] slope are hemlock-white pine, the south [-facing] slope is mixed oak. . ." (Erdman and Wiegman 1974). While this statement over-emphasizes the occurrence of white pine, it does convey the marked variation in forest-canopy dominance. The bottomlands are dominated by hemlock and yellow birch and with increases in elevation up each ridge from Swift Run, the composition and abundances change and black birch, red maple, and chestnut oak occur in great numbers. With a limited number of old-growth forests available, learning about the composition and structure of landscapes such as the Snyder-Middleswarth Natural Area serves to increase our understanding of vegetation dynamics while providing valuable information about the specific traits of the site and species examined. The striking gradient of vegetation that occurs within the Snyder-Middleswarth old-growth forest provides an opportunity to study what edaphic and topographic gradients correlate with the distributions of species. We examined the tree species composition and size distributions of the Snyder-Middleswarth old-growth forest and correlated the vegetation pattern with a number of environmental, edaphic, and topographic parameters. Our goals were (1) to describe the vegetative pattern, (2) to discover what environmental, edaphic, and topographic factors correlate with this vegetative pattern, and (3) to examine the size distributions of the predominant species. Our study was conducted within the Snyder-Middleswarth Natural Area, part of the Bald Eagle State Forest, 8 km northwest of Troxelville, Pennsylvania (40[degrees]48'N, 77[degrees]17'W). The site has a temperate climate with warm, humid summers and only moderately cold, humid winters. The region's highest average monthly temperature of 23[degrees]C occurs in July and the lowest of -3[degrees]C occurs in January. Mean annual precipitation for the region is 103 cm and is evenly distributed throughout the year (30-yr means, NOAA data for Williamsport, Pennsylvania). The old-growth forest is located in a narrow and steep ravine between two ridges that run east to west; Buck Mountain lies to the north and Thick Mountain to the south. The ravine, created by Swift Run, has well-developed north-facing and south-facing slopes as well as a bottomland. Elevations in the sampled area ranged from 451 m to 548 m, with slopes varying in steepness from 1-68%. The predominant soils are extremely stony and sandy well-drained loams that have weathered from sandstone and shale and have low to moderate available water capacity (Eckenrode 1985). The soils of the bottomland, slopes, and Buck Mountain ridge top are mapped as Hazelton (mesic Typic Dystrochrept) or Clymer (mesic Typic Hapuldult) soils while the Thick Mountain ridge top is covered by lingers (mesic Typic Hapludult) soils. Thanks originally to the inaccessibility of this ravine and in 1965 to its preservation as a National Natural Landmark, the approximately 135-ha portion of this forest included in our study has never been logged. The extent of direct human impact to the area is a footpath that runs along the northern bank of Swift Run and loops back along the north-facing slope. Hunting of deer and other game is allowed in the adjoining state forestlands. There have been many natural disturbances within this old-growth forest during the past three decades (Abrahamson, pers. obs.). Windstorms, especially those associated with snow or ice events, have toppled a number of the larger hemlock and yellow birch throughout the stand. 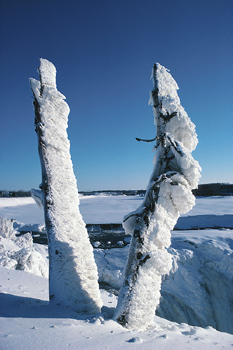 Furthermore, the crowns of slope and ridge top trees frequently show evidence of wind and/or ice damage. Gypsy moth outbreaks have occurred periodically within central Pennsylvania since the mid-1970s and likely have markedly impacted the oak canopies within the study area during one or two growing seasons. Tree ages were not determined as no coring was performed; coring studies were beyond the scope of this initial study of this old-growth forest. We recognize the limitations of using size distributions when inferring past disturbances (Lorimer 1985), however, we feel that in the absence of tree-age data, size-distribution data provide at least some insight into the successional status of species.